On top of sharing how she runs her thriving Mobile Money Agency shop in Kitale Jackline opens up about her journey with Juhudi. Jackeline, a mother of 4, who is an assiduous smallholder farmer residing in the Kitale area of Kenya. Her biggest struggle for several years revolved around improving the crop yield of her small-sized farm. She tried a lot of different ideas productivity of which none yielded resounding success. With time, things got thick, she wasn’t generating enough income, and her children were at the brink of dropping out of school and couldn’t find a job to generate some income for her family. In early 2014, Jackeline was running her usual errands in Kitale town when she decided to walk into the Juhudi Kilimo Kitale Branch office, then situated next right next to Suam Supermarket. She had had little about Juhudi Kilimo Microfinance from her neighbors and wanted to find out more. Learning about the products and services Juhudi offers she invited a loan officer to a group of farmers which she was a leader. “We had a positive engagement with the loan officer and, as a group, we decided to join Juhudi.” She unravels. 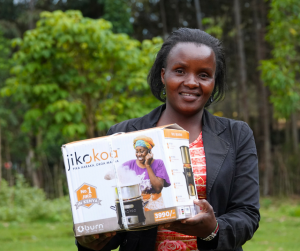 Today, Jackeline has successfully serviced 2 loans from JKL: She used her first loan of KES 40,000 to buy a dairy cow and the second loan of KES 110,000 to purchase a new motorcycle for ferrying farm inputs/produce and passengers. Early this year, Jackeline opened up a Mobile Money Agency shop in Kitale and employed an agent to facilitate mobile money transactions for Mpesa user customers in town. She has also expanded land under cultivation through lease to plant more maize. In the near future, Jackeline plans are to acquire more real estate for crop farming. She also has plans of buying a 14-seater minibus (Matatu) to start a public transport business. Jackeline’s livelihood has improved greatly since had access to financial services. She’s very positive and hopeful for her family’s future. ” I see a bright future for my children. My eldest son just joined High School. Thanks to Juhudi, I can now afford my children’s school fees comfortably.” she concludes.